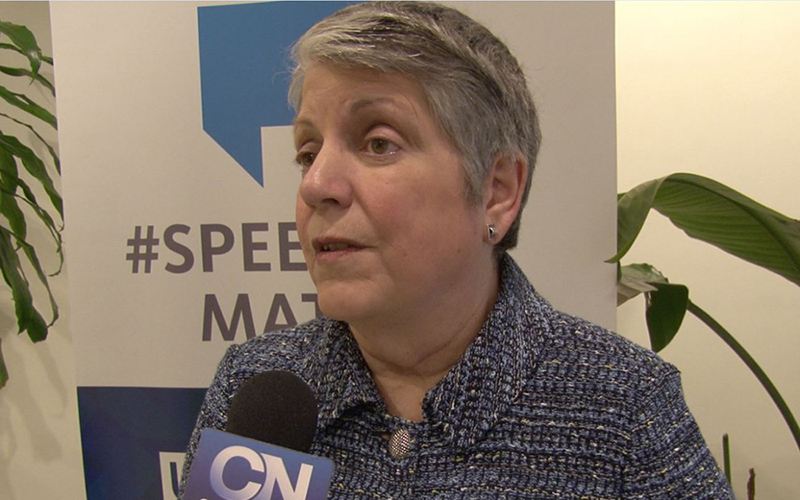 Napolitano, now president of the University of California System, made the comments after a forum just blocks from the White House where President Donald Trump signed an executive order for “improving free inquiry, transparency and accountability” on campuses. But Trump, surrounded by conservative college students who said their voices have been squelched by campus administrators, said the order is long overdue. 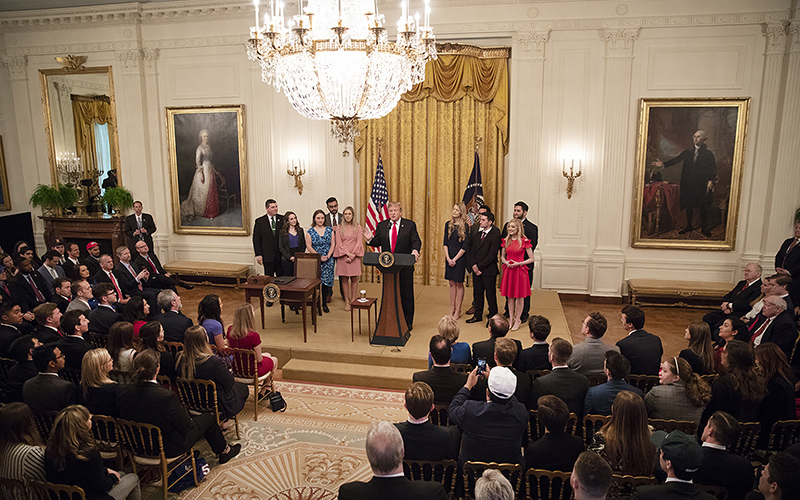 “Under the guise of ‘speech codes’ and ‘safe spaces’ and ‘trigger warnings,’ these universities have tried to restrict free thought, impose total conformity and shut down the voices of great young Americans like those here today,” he said before the East Room signing ceremony. The executive order would withhold federal research dollars from public schools universities – what Trump said could amount to “billions and billions and billions of dollars” – that don’t protect free speech on campus. “We must encourage institutions to appropriately account for this bedrock principle in their administration of student life and to avoid creating environments that stifle competing perspectives, thereby potentially impeding beneficial research and undermining learning,” the order said. But it was thin on details, except to say that free speech policies would have to comply with existing laws and regulations. While it was highlighted, the free speech language was just one part of a six-part policy that was mostly dedicated to improving reporting of educational outcomes and clarifying the student loan process. 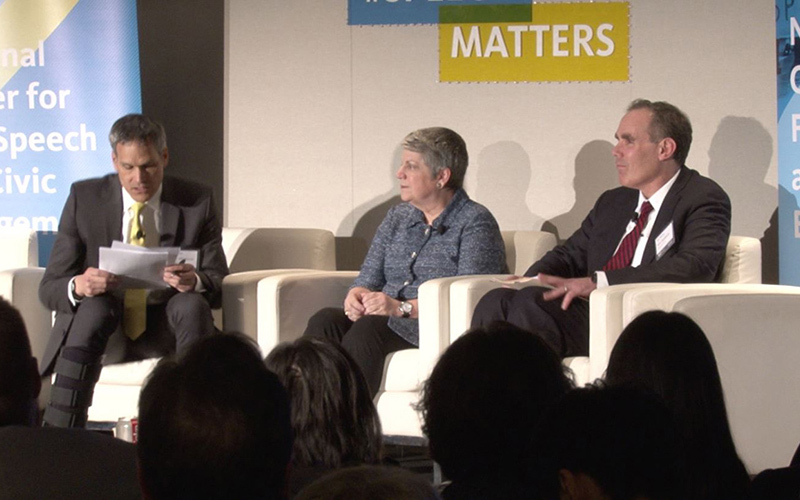 “It’s very vagueness permits us worry,” Napolitano said. Napolitano agrees with the goal. As president of the UC System, she dealt with the aftermath of a 2017 protest at University of California, Berkeley, when protests at the liberal campus caused $100,000 in damages in response to a planned speech by a conservative activist. Students like Judah Waxelbaum, chairman of the Arizona Federation of College Republicans and a sophomore at ASU majoring in political science. Waxelbaum said the conservative opinions that got him into trouble with high school teachers continued to be an issue when he got to campus. Jacqueline Pfeffer Merrill from the Bipartisan Policy Center said that intolerance could stem from a lack of intellectual diversity among the professors. She said more vocal conservative voices on faculty could deter damaging protests sparked by conservative campus speakers. “I think if we don’t have scholarly, academic, thoughtful, conservative faculty on campus then more students are tempted to invite provocateurs that cause these campus upsets,” Merrill said. Like Napolitano, Waxelbaum said he supports the sentiment behind the executive order, but worries about the government auditing free speech on campuses. “I’m always worried of anyone being the arbiter, whether it’s Twitter deciding what should be on the platform or whether the government gets to decide what free speech looks like,” he said. “But I don’t think that’s a lot to be asking for that if you’re a taxpayer-funded institute, you should be following the law,” Waxelbaum said.